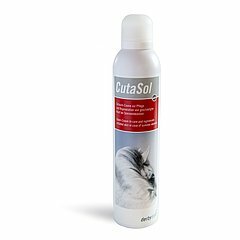 CutaSol offers an optimal treatment of summer eczema due to the selected ingredients. The texture the patented foam cream builds up a breathable, twodimensional protection and promotes recovery of the skin barriers function. Skin equivalent lipids build up a breathable, two-dimensional protection and promote recovery of the skin barrier function. Urea increases the content of water in the horny layer, softens it, soothes the itching and has antibacterial characteristics. Aqua, urea, decyl oleate, octyldodecanol, butane, panthenol, cetyl alcohol, glycerin, propane, stearic acid, glyceryl stearate, caprylic/capric triglyceride, hydrogenated lecithin, squalane, zeramide 3, allantoin, butyrospermum parkii butter, potassium, lauroyl wheat amino acids, palm glycerides, sorbitol, sodium lauroyl sarcosinate, capryloyl glycine, pentylene glycol.